The T-14 Armata (aka Object 148) is a next generation Russian Main Battle Tank officially unveiled to the public and world media during the 2015 (May) Moscow Victory Day Parade. The T-14 represents a significant change for the Russian Army, in both a long awaited commitment to spending on new equipment and the much needed replacement of old technology with new, as part of its current program of modernisation. The T-90A (the version of the T-90 in Russian service) was an upgraded T-72 Main Battle Tank. It has been in service as a stop gap since the 1990’s and the army has not bought any new T-90 for some years, most recently opting to modernise older T-72 to the T-72B3 standard. Russian companies had been developing the next generation of Main Battle Tank such as the Black Eagle and T-95 since the 1990’s, but without secured financing for development and orders, these projects have since ceased. The T-14 development followed the cancellation of the T-95 in 2010 and has taken roughly 5 years. Both vehicles were developed by Uralvagonzavod who will also complete production of the new tank. 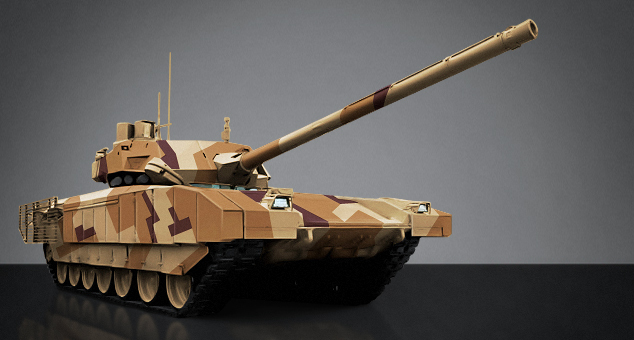 The T-14 is the first Russian Main Battle Tank accepted and scheduled to enter army service that uses an unmanned turret. 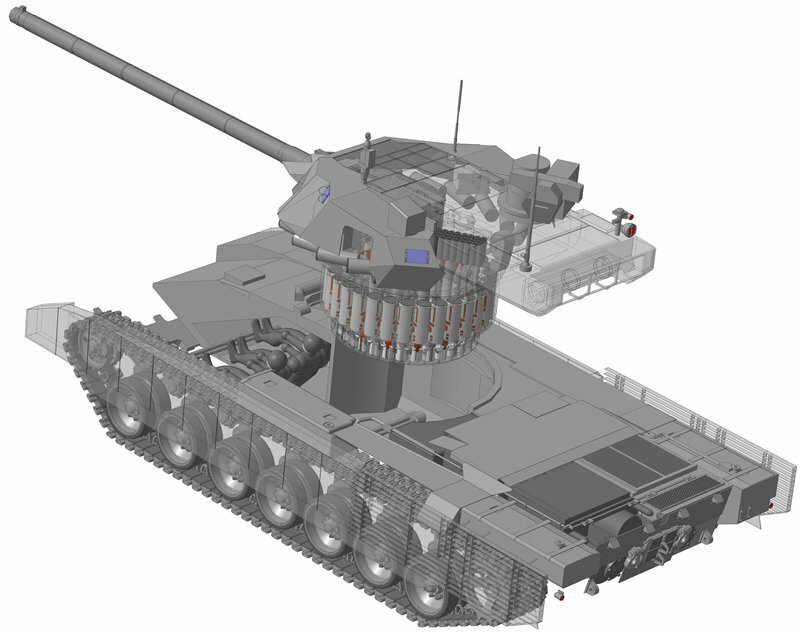 The turret contains the main gun, its autoloader and ammunition storage, as well as other sub systems. The 3 man crew sit in front of the turret in a separate compartment in the front of the hull. The engine, transmission etc are located in the rear of the hull. In the development of the tank a new armoured steel plate was developed called 44C-SV-W. It’s understood that it’s lighter than normal steel and used in the vehicles construction to reduce the vehicles weight. A steel and new ceramic composite armor has been added across the normal frontal arc. 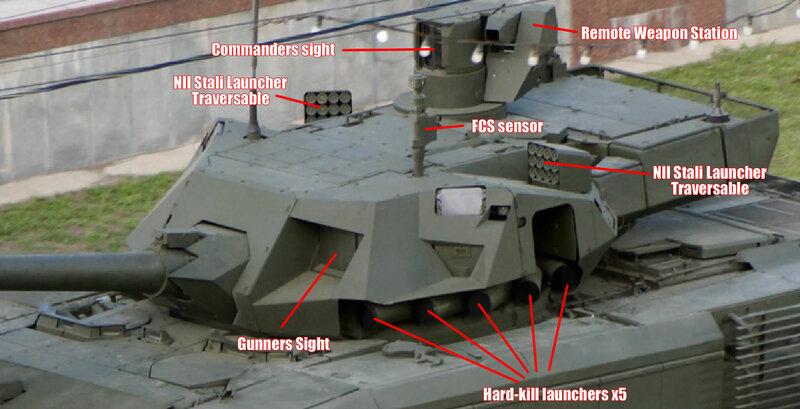 In addition a new dual Explosive Reactive Armor has been added on top of this, now referred to by Russia as “modular”. This new ERA (reportedly named as Malachite) is visible on the vehicle (marked as 1. on the above image) by its shape/lines. It’s claimed that the new armour offers protection levels of 1000–1100 mm vs APFSDS and 1200–1400 mm vs HEAT. 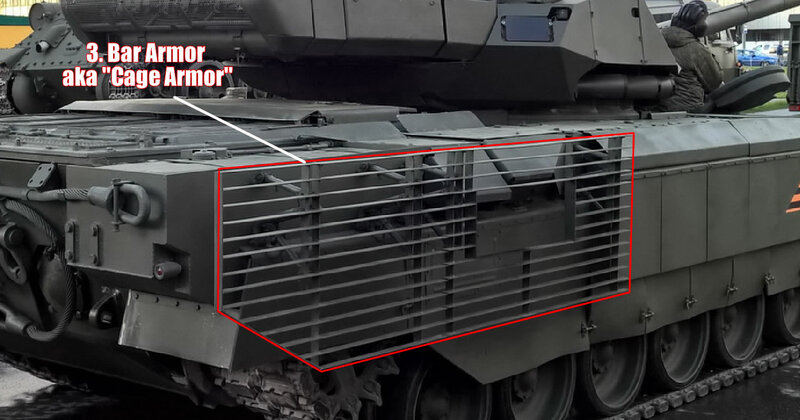 The Armata is also fitted with modular armor along the side of the hull. Sources indicate that these contain either composite or ERA, depending on the mission requirement. The rear engine section of the hull has a section of bar armor to protect against single charge RPG-7 attacks. The turrets futuristic frontal shape and the material used in its construction is supposed to reduce its thermal signature and does not represent its true shape. Mounted on the turret are 2 active protection systems, 1 a hard killer system and the other a masking system. The Afghanit hard kill system launching tubes used to fire projectiles at ATGM & HEAT rounds, are located low on the turret sides. X2 traversable NII Stali (manufacturer’s name) Upper Hemisphere Protection Complex launchers and a further x2 embed launchers are installed on top of the turret. These are described by the manufacturer as “The principle of operation is based on the detection of complex precision-guided munitions flew, striking the upper hemisphere, and the disruption of its guidance system or a powerful electromagnetic pulse, or the creation of securable multispectral aerosol cloud of false and IR purposes”. The crew are offered greater protection by being moved to the hull. Their fighting compartment is protected by armoured bulkheads separating them from the autoloader and ammunition storage in case of a catastrophic failure. The vehicle has full NBC protection and may have an internal fire detection and suppression system. The main gun is the 125mm 2A82-1M smoothbore. It is capable of firing all standard types of ammunition including ATGM giving it a firing range of 8km. Russian media reports that a new Armour-piercing fin-stabilized discarding-sabot (APFSDS) round called Vacuum-1 is being developed for the T-14 as is a new HE-FRAG called Telnik and a new 3UBK21 Sprinter ATGM. The 125mm 2A82-1M is noticeable in that it does not have a fume extractor. These are normally used to pull the toxic gases from the firing process out of the muzzle after the round has exited so they do not blow back in to the turret when the breach is open so the crew avoiding breathing in the gases. As the turret is unmanned a fume extractor is not required. The main gun is coupled to the autoloader, which Russian media has said is capable of firing 10+ rounds per minute. The Fire Control System has the latest version of thermal sighting equipment for the gunner and commander’s independent sight. The ballistic computer has the latest sensors and laser range finder and is able to track moving targets increasing the 1st hit probability of the main gun. The main gun and sights are stabilised for observation and firing whilst on the move. The vehicle has a coaxial 7.62mm Machine Gun and a Remote Weapon Station with a 12.7mm MG on top of the turret. The T-14 is powered by a 1500hp Diesel Four-12N360, 12-cylinder turbocharged gas turbine engine supplied Chelyabinsk Tractor Plant. It’s possible that the vehicle uses an automatic transmission. All displays for the crew are the latest flat screen technology for displaying sights, battlefield management and the commanders fault system, which monitors all systems in the vehicle and alerts him to any faults. Russia like a lot of countries have been developing and experimenting with larger bore calibre main guns. Generally these offer no significant increased advantage in firing Kinetic Energy APFSDS rounds, as the smaller calibre main guns (125mm) have a higher firing pressure and larger calibre are low pressure. However they do offer advantages for shaped charge ammunition like HEAT rounds and ATGM, as the shaped charged size can be increased or a second charge added (known as a tandem charge). Whilst using these larger main guns offer the advantage of increased barrel life, less fatigue to the vehicle as they have a lower pressure whilst firing, they have issues such as a less number of rounds stored. Further complications arise in that the length of the part of the main gun in the turret increases and when fired the recoil goes back so far it causes problems in the reloading of an autoloader. 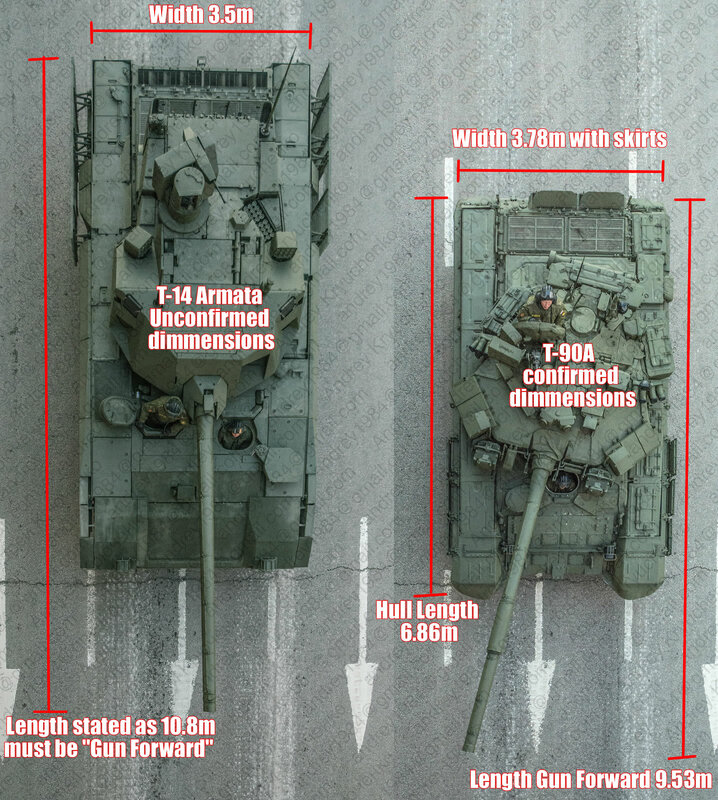 These type of issues were confirmed in 2015 from recent declassified information we found of similar large calibre 140mm main gun projects outside of Russia and may very well be why the T-14 Armata has not yet been fitted with the 2A83 152mm main gun that started development in the 1990’s for the T-95 tank project. The cost of producing the T-14 has greatly increased since original projected costs, to 7 million dollars per tank. Despite the price increase of the T-14, The Kremlin has confirmed it has budgeted for 2300 T-14 to be purchased for the Russian army between 2015 and 2020. As of October 2015, 20 have built for display, trials and possible training. The T-14 will replace the T-90A as Russia’s frontline tank. We predict that the T-90A and upgraded T-72B3 will take a secondary role (storage or reserve units) with the T-80, which hasn’t been bought or upgraded for over a decade will finally be retired. Russia has been attempting to increase its exports of new modern technology to the Middle-East in 2015, with Kuwait trialling the T-90SM Main Battle Tank. Russia is in active discussions with Egypt, who prior to the Gulf War imported large amounts of Russian armour. Uralvagonzavod had announced they were putting on a demonstration in late 2015 for Egypt to show the Armata’s capabilities. Egypt’s response and assessment of the demonstration are not yet known. Special thanks to our fellow TankNut & Contributor Rustam Bogaudinov for helping with the content on this page.